The landscape of Christian literature, and of Christian discussion generally, lacks an honesty. There’s a difference between telling the truth and honesty. Telling the truth is the virtue of speaking accurately, honesty is the virtue of presenting all of the truth. Two people can tell the truth, they can each speak accurately, objectively even, but paint two very different pictures of the same event. To win in the marketing industry is to find a way to be the most dishonest without saying anything untrue. Honesty, on the other hand, is to present the whole truth, the whole context. When your spouse says “Be honest with me…” she’s not asking you to make an accurate statement, she’s imploring you to tell her everything, even to divulge your most unflattering motivations. To be honest as a writer is challenging. Telling the truth is easy, but there’s no cross examination in a book or an essay, it is the writer’s liberty to craft a single-sided argument, to tell true things which support the narrative and leave out the rest. Aaron Daniel Behr, however, has achieved a triumph of honesty with The Husband. The book recounts the true (there’s that word again) story of his wife’s adultery and demand for a divorce and Aaron’s journey to cope with his mental illness, Aaron has surely not presented every side of the events. Such a book would be cumbersome and ultimately very boring. But he has plainly and intentionally left the cracks in his own narrative, like tilted mini blinds, so that you can see through to the other side of the story. As his developmental editor, it was my pleasure to work with Aaron to guide him as he refined and crafted The Husband. I can truthfully say that he achieved so much in this narrative and it is an excellent book. And I can honestly say that the book reached a quality level that far surpassed my highest hopes. This book belongs on the shelf next to Donald Miller. I’ve read Christian testimonial type literature before. The format is simple: I was broken (the more broken the better), then I met Jesus and now I’m fixed. There’s a truth to that, and without a doubt, those stories are useful. But The Husband is different, and I’ve never read anything quite like it before. Aaron, narrating his own story, knows Jesus from start to finish, but he’s still stuck in this world of sin—his own brokenness and the brokenness of those around him. Aaron recounts that as he prepared to hang himself from the home gym in his basement, one of his last actions was to search for an article online that told him suicide wouldn’t send him to hell. His faith is present throughout, and it’s in tact, but he is not fixed. His life is not fixed. His faith is not the climax of the story, it’s the premise. Being a Christian is hard. How do we reconcile the ways other Christians hurt us with our understanding of Biblical community? How do we reconcile our sin towards others with the idea of God living inside of us? How do we cope with our own mental illness, when the Bible promises that Jesus will make us a new creation? This is the stuff of being a real Christian. These are the questions that separate the Sunday-morning box checkers, from the followers of Jesus trying to live His kingdom on earth. Our faith is lived in the hard questions. 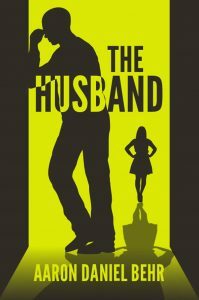 We need more books like The Husband. We need more Christian authors like Aaron Daniel Behr. The Husband was released by Columbus Press on January 23. It is available on Amazon, BarnesandNoble.com, iTunes, and Kobo, among other retailers. Learn more about The Husband here, or learn more about Aaron at www.AaronDanielBehr.com.